There are different ways to cook up your pumpkin. You can cut it up and peel it and than steam it. I do mine different and I think it is a much simpler way to do it. First off, smaller pumpkins are easier to work with. Use pie pumpkins for baking, if possible. They are meatier. 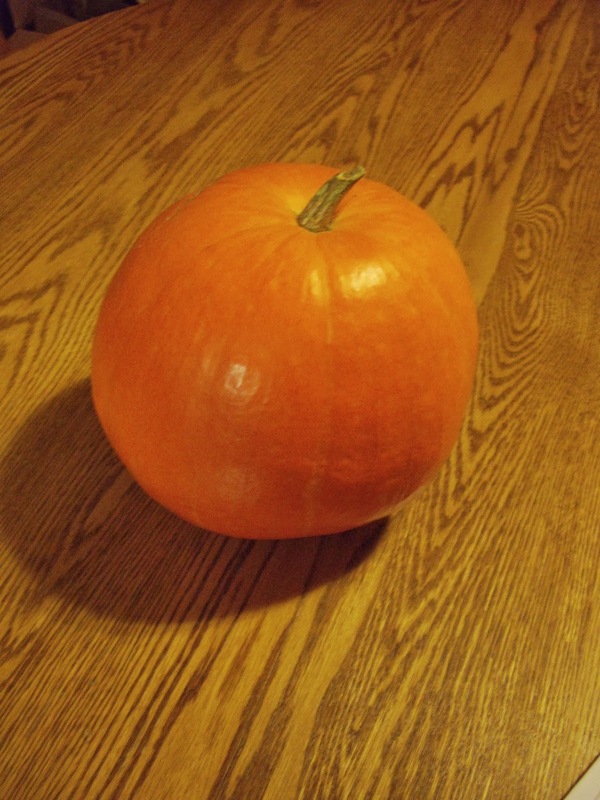 You can also use all purpose pumpkins that are grown for baking or jack-o-lanterns. But, the great big ones have a lot of liquid in them and your baked goods don’t turn out quite as well . You will need a an or two to hold the pumpkin halves. To puree, you will need a blender or food processor. Now, cut your pumpkin in half. Cut it in half so that the top half is one piece and the bottom half is the other piece. Don’t cut it in half the other way. It is easier to cut that way. But, it takes a lot longer to get the pumpkin to cook though. I really don’t know why, but it just seems to. Now, you need to scoop out all the seeds. Those you can either save to roast for a treat. Or you can save them to dry and plant later for more pumpkins. Take the pumpkin halves and place cut side down in the pan. Pour a small amount of water into the bottom of the pan. Bake for about an hour and a half or until the pumpkin is tender when pierced with a knife. Check once in a while to make sure there is still water in the bottom of the pan. If the pan is dry, add a little more water. When the pumpkin is tender, take out of the oven and let it sit until it is cool enough to handle. When you are able to handle the pumpkin, take a spoon and scoop out the pumpkin pulp out of the shells. Add to the container of a blender or food processor. Now,you are ready to bake or freeze it. Canning is no longer recommended by the USDA. We bought a big pumpkin and neither of us could cut it. Ended up throwing it out. Will look for smaller pumpkins next time although I ended up using canned pumpkin to make my soup. Jo, some of those rinds can be pretty hard. I've had trouble before too.